These zucchini roses are incredibly easy to make yet create a wonderful visual statement to any party where finger food is being served. The roses may appear fiddly and difficult to make but with the assistance of muffin or a cupcake moulds these vegetarian roses can be prepared quickly and easily in just a few steps. It’s a novel way of serving up a version of what is classically Italian Zucchini Parmigiana. Classic Italian Zucchini Parmigiana served up as Zucchini Roses. Thinly slice the zucchini lengthwise. For ease use a mandolin to achieve a uniform thickness. Sear the zucchini slices under a grill or on top of a hotplate for 10 seconds each side. Set aside and season with a little salt and pepper. Thaw a sheet of puff pastry and using a sharp knife slice the pastry into strips of approximately 3cm wide. Pending the thickness of the zucchini slices, place 2-3 layers of the zucchini on top of each piece of pastry. Cover the zucchini with a spoonful of Tomato salsa. Cube the Brie and scatter over the salsa. 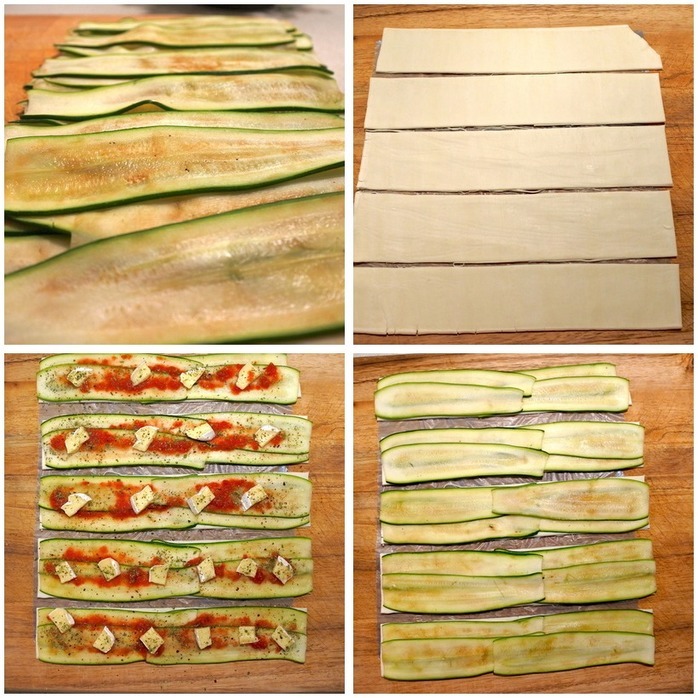 Slice Zucchini lengthwise and lightly sear under a grill or on a hotplate; Cut pastry into 3cm strips and layer the zucchini on top of the pastry; Add layers of tomato salsa and cheese and season with oregano, salt and pepper. Starting from one end of the pastry, roll into a cylinder shape then pinch one side of the pastry to form a flower base. Repeat this technique with the remaining pastry. Place each zucchini rose into a muffin tin or cupcake mould. Muffin or cupcake tins are useful in helping to hold the zucchini roses in place while baking. Place the zucchini roses into a preheated 180°C oven and bake for approximately 30 minutes. Just before serving sprinkle a little parmesan cheese over the top of each flower. Serve hot or cold.